Although the consequences of traumatic meniscus tears and the importance of meniscal repair are well-established in adults, the same cannot be said for the young population. 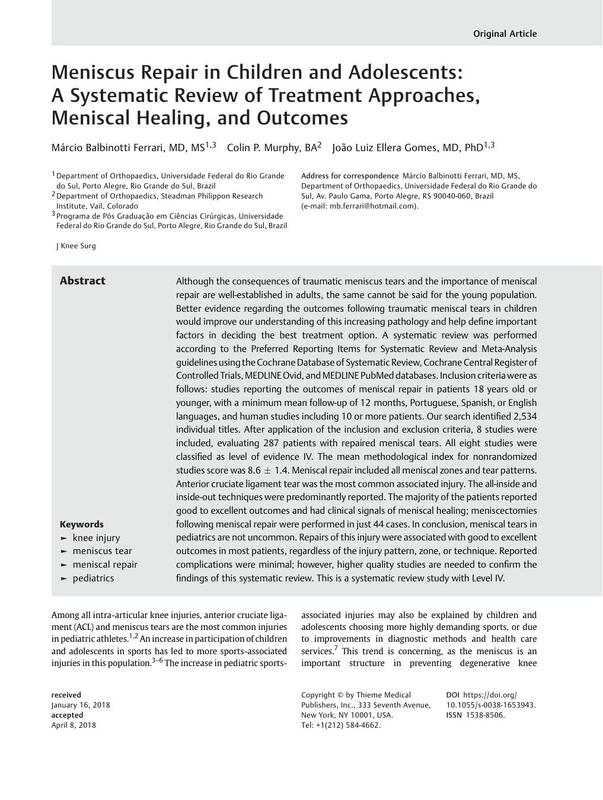 Better evidence regarding the outcomes following traumatic meniscal tears in children would improve our understanding of this increasing pathology and help define important factors in deciding the best treatment option. A systematic review was performed according to the Preferred Reporting Items for Systematic Review and Meta-Analysis guidelines using the Cochrane Database of Systematic Review, Cochrane Central Register of Controlled Trials, MEDLINE Ovid, and MEDLINE PubMed databases. Inclusion criteria were as follows: studies reporting the outcomes of meniscal repair in patients 18 years old or younger, with a minimum mean follow-up of 12 months, Portuguese, Spanish, or English languages, and human studies including 10 or more patients. Our search identified 2,534 individual titles. After application of the inclusion and exclusion criteria, 8 studies were included, evaluating 287 patients with repaired meniscal tears. All eight studies were classified as level of evidence IV. The mean methodological index for nonrandomized studies score was 8.6 ± 1.4. Meniscal repair included all meniscal zones and tear patterns. Anterior cruciate ligament tear was the most common associated injury. The all-inside and inside-out techniques were predominantly reported. The majority of the patients reported good to excellent outcomes and had clinical signals of meniscal healing; meniscectomies following meniscal repair were performed in just 44 cases. In conclusion, meniscal tears in pediatrics are not uncommon. Repairs of this injury were associated with good to excellent outcomes in most patients, regardless of the injury pattern, zone, or technique. Reported complications were minimal; however, higher quality studies are needed to confirm the findings of this systematic review. This is a systematic review study with Level IV.